I have my power back! Nicole's story. When I started this program I was scared, had given my power away, didn't love myself all that much and had limited self-control. Here is my story. 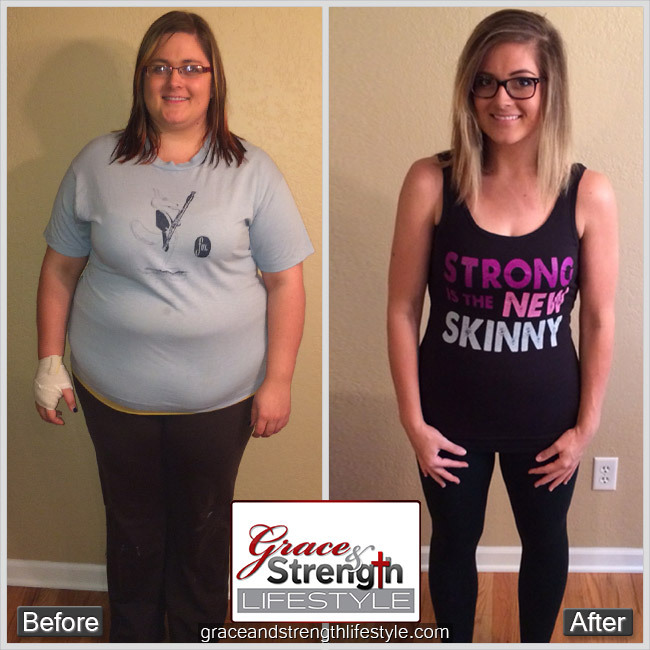 I started the Grace and Strength Lifestyle program on May 1st. By mid-July I had lost almost 40 pounds. I gained a new relationship with Christ, a sense of peace that I hadn't felt in years and a hope for a healthy future for my mind, body and spirit. It isn't Photoshop. It's a real life transformation. - Way to go Michelle! Michelle's Success Story. A little over a year ago, I sat in a friend’s kitchen listening to her talk about her journey with the Grace and Strength program. At this point in my life, I’d wasted countless dollars on countless diets, always failing, and always gaining back more than I’d lost. It had taken just one short year for me to gain back the weight I’d lost before my wedding. Life can get in the way! We need to be prepared! Elaine's Story: I was struggling daily with back and joint pain and had noticed a steady rise in my total cholesterol level. It was clearly evident that I was heading in the same direction as many of my patients and if I did not make some serious changes I might not be able to enjoy a long and healthy life with my children and family. I needed a soul cleanse! Mary's Story: My journey with Grace and Strength started February 25th, 2017. My very first daily weight text message that I sent to coach Monica included this: "I feel so yucky". I have battled my weight for as long as I can remember. As a child I was always "big". Less of me means more of HIM! Crystal's story: I spent too long, too many years, not living my best life. I was heavier than I needed to be. I barely had energy to do all of the things I thought I needed to do. Life was pretty hectic, between family, active kids, busy work and travel schedule and aging and ailing parents. I was so busy trying to check off a to-do list of to-do’s for everyone and everything else, that I wasn’t paying enough attention to myself. Or to God.